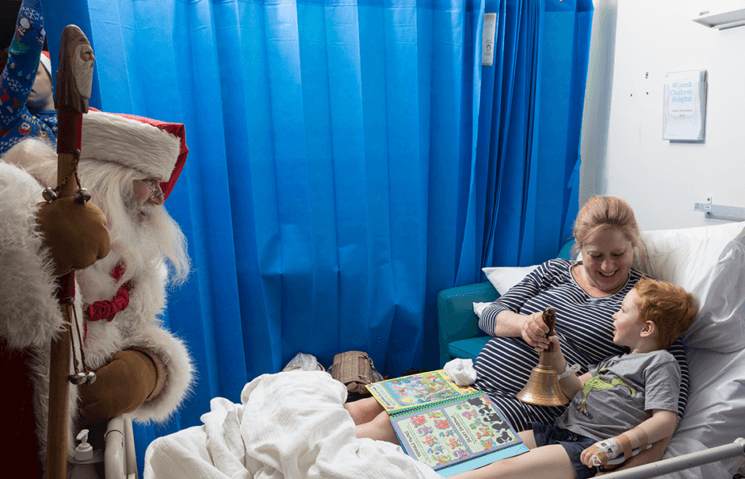 Driven by wish to bring the Christmas spirit to children’s hospital beds, photographer and digital artist Karen Alsop started The Christmas Wish Project. She did something similar in the past through The heART Project, putting smiles on faces of children with medical difficulties. Since she has been more than just a good person, she had no problem getting Santa to help her with the new project. And so they visited Monash Children’s Hospital in Victoria and started their photographic marathon. Karen, her team of Elves and Santa himself arrived to the hospital at 8:00am on 29 November. They constructed a studio in an empty room, and everything was ready for photo shoot. They invited kids and their families to the studio to meet the Santa and take photos with him. Since there were children who were unable to leave their beds, Karen and Santa made sure not to leave them out. They visited them in their rooms and took the photos there. The atmosphere was festive and fun, which is already magical enough considering that it all took place in a children’s hospital. But, that was when the magic was only beginning. Karen took 30 photos at the hospital and then started creating individual artworks for each of the children. She and her Elves worked hard to composite each child into the magical holiday scene. Each of the scenes was handcrafted from various Karen’s photos and took over 20 hours of preparation in Photoshop. As soon as each piece was completed, Karen sent it to be printed, and then cut, framed, labeled and wrapped. After hours of hard work, lots of good will and some magic, the artworks were ready for special delivery that night. Santa, Karen and the team started delivering the artworks through the ward. The final results amazed the children and their parents as they unwrapped the present. Karen’s project brought smiles to their faces and helped them escape from reality at least for a moment. Although photography cannot cure the illness, it can change the point of view and be an escape from harsh reality. And thanks to Karen, her vivid imagination and the help of her team, these children have a moment of happiness they can escape to.